Universal Audio Apollo 16MkII. Flagship Apollo Conversion for Professional Studios. The Universal Audio Apollo 16B is an elegant update to UA’s premium audio interface — delivering enhanced sound with the tone, feel, and flow of analog recording. Perfect for professional studios, this 18 x 20 Thunderbolt 2 interface offers twice the analog connectivity of the Apollo 8/8p — making it ideal for pairing with mixing consoles and outboard processors. Built on genuine UA analog design and next-generation A/D and D/A conversion, Apollo 16 also features powerful UAD-2 QUAD Core processing, letting you run the full library of UAD Powered Plug-Ins in real time. With sonic performance that surpasses anything in its class, Apollo 16 rivals modular converters costing twice the price, in a sleek, powerful new package. 16 x 16 analog I/O via DB-25 connectors — ideal for pairing with mixing consoles, outboard preamps, etc. Imagine having a classic analog studio, in single rack space. Apollo 16 lets you record through UAD Powered Plug-Ins — including vintage EQs, compressors, reverbs, tape machines and more — at near-zero latency, regardless of your audio software buffer size. With award-winning UAD plug-ins from Ampex, Lexicon, Neve, Manley, Roland, SSL, Studer, and more,* Apollo 16 serves up authentic analog tone and warmth. Apollo 16 comes bundled with “Realtime Analog Classics Plus” suite of UAD plug-ins. 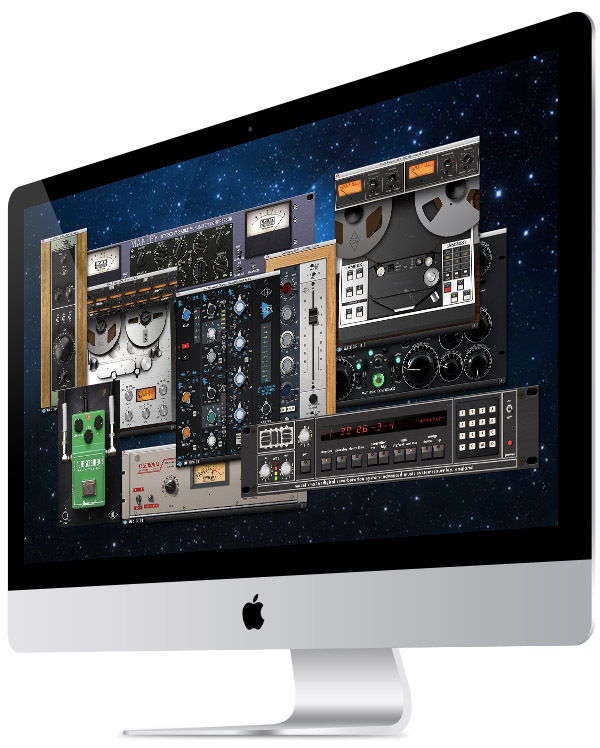 From there, you can choose from a vast and expanding collection of plug-ins in the UA Online Store. Unique among 16 channel converters, Apollo 16 features a dedicated Monitor knob right on the front panel. This knob is also controllable from software, a connected Apollo Twin, or can be bypassed for connecting the Monitor outputs to an external monitor controller. Standard interface settings like Clock Source, Sample Rate, and Host connectivity are displayed at all times as well. With Apollo 16’s Console 2.0 application — a complete re-imagining of Apollo’s original Console software — you can take advantage of over 25 new user-requested features such as Channel Strip presets, Drag & Drop functionality, dynamically resizable windows, and more. The Apollo 16 interface places all the most commonly used recording and monitoring features right on the front panel, for fast, direct access. 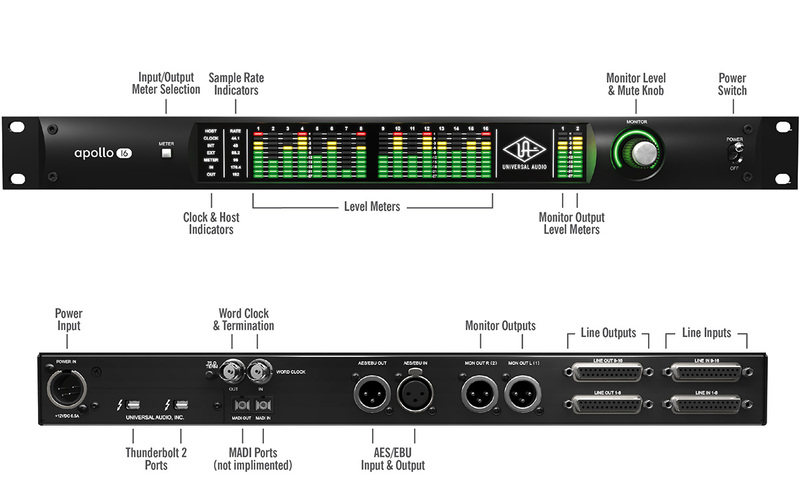 Similarly, its rear panel provides all the dedicated, high-quality I/O needed for a typical production studio.